It’s phenomenal story on paper, but when you read between the lines, it’s almost 100% certain that this latest ‘domestic terror’ event in the Silicon Valley, Northern California was a government-sanctioned operation. This attack happened nine months ago in April 2013, but was only publicly acknowledged by authorities this week. 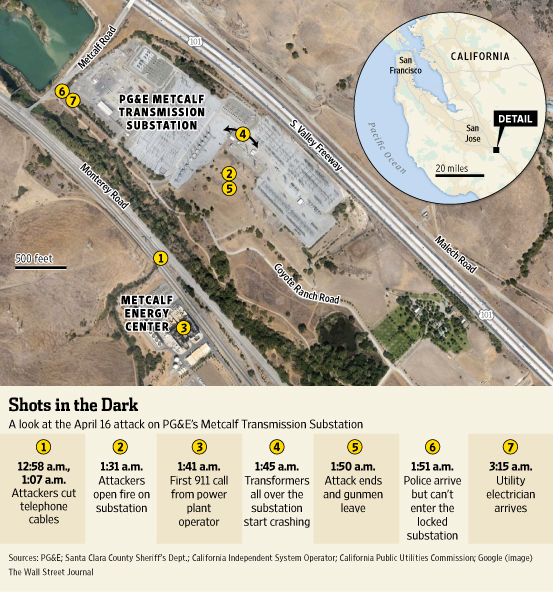 The Wall Street Journal reports that a former Federal Energy Regulatory Commission chairman Jon Wellinghoff has finally admitted that a group of snipers shot up PG&E Corp.’s Metcalf transmission substation, located inside Santa Clara County, last year in 2013.The attack was incredibly quick and executed with total precision – an attack which lasted only 19 minutes. In that short space of time the shooters were able to knock out 17 transformers causing a power-down and a closure of that power station. According to Wellinghoff, the attack was “the most significant incident of domestic terrorism involving the grid that has ever occurred (in the U.S.)”. If you consider the obvious probability that a team of snipers that well organised and effective would be a highly trained group of shooters (most likely trained military assets), then this naturally points right back to the US government as the prime suspect for this attack. The mainstream media and some alternative media outlets are reporting this as a “real terror attack on US soil”, but have yet to reason what the motive would be in this conspiracy to take out a power station – we say conspiracy because authorities clearly admit that this was an organised team effort – and definitely the work of trained professionals. This event can only be described then, as a false flag attack on American soil. What is the motive? Authorities would to have the public believe that the motive is that a few civilian men wanted to combine target practice with fomenting general chaos. Who would be the beneficiaries of an incident like this? Top of the list would be the Department of Homeland Security who is desperate to retain its incredible tranche of funding at a time when a number of federal budgets are being slashed. Next would be those involved in the corporate protection rackets like those major insurance companies who sell premiums to municipalities and large retail energy suppliers. Those who still believe that this was the work of a home-grown terror cell, read between their own lines: according to the U.S. Navy investigation ordered at the request of FERC chairman Wellinghoff, “it was a targeting package just like they would put together for an attack”. ‘Just like they would put together for a real attack’, he says? Exactly, because this wasn’t a real terror attack.